Community View Lions Club presents the 3rd annual CMHA Snowflake Soiree on Friday, January 30th, 2015. Taking place at Higdon Hall. Cocktails will begin at 6 PM, and supper at 7 PM. Entrainment and auction to follow. 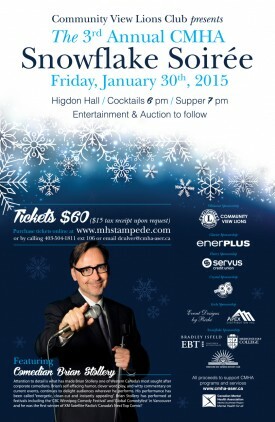 Entertainment will feature comedian Brian Stollery. Esplanade Museum and the Archaeological Society of South East Alberta are presenting “Stones and Bones”, a workshop on Saturday, May 24 from 1:00 PM to 4:00 PM in the Cutbanks Room at the Esplanade Arts and Heritage Centre. The workshop is designed for local collectors of arrow heads, stone tools, ancient animal remains and geological specimens. Curators from the Royal Alberta Museum in Edmonton will be available to examine, identify and discuss these items. Ancient items frequently turn up in farmers’ fields and on ranch land in this area. Some are easy to identify, but many are not. Here is an opportunity to learn more about these collections found in our community and local vicinity. Visitors from outside of Medicine Hat are welcome to attend the workshop as well as a presentation by Chris Jass, an Ice Age specialist from the Royal Alberta Museum. “Of Mammoths and Mice: Explorations into Alberta’s Ice Age Fossil Record,” will begin at 7:30 PM in the Cutbanks Room at the Esplanade. Visitors are also invited to tour the Esplanade Museum’s feature exhibit, “Ice Age Mammals,” at no charge throughout the day and prior to the presentation. The Lunchbox is the final film for Monday Night at the Movies until September. The screening takes place at 7.30 pm at the Monarch Theatre on May 19. Irrfan Khan (Life of Pi, Slumdog Millionaire) stars alongside the radiant Nimrat Kaur in Ritesh Batra’s delightful feature debut, in which a mistaken lunchbox delivery paves the way for an unlikely romance. In Mumbai, home to over 18 million people, more than 5,000 famously efficient dabbawallas — lunchbox couriers — navigate chaotic streets to deliver lunches, lovingly prepared by housewives, to working men across the city. Ila (Kaur) is a housewife living in a middle- class neighbourhood with a husband who ignores her. Saajan (Khan) is a beaten down widower about to retire from his number-crunching job. After Ila realizes that Saajan is receiving the meals meant for her husband, the two begin sending each other letters through the lunchbox. What starts as an innocent exchange about Ila’s cooking gently develops into something more. Whether it’s the cooking of a meal, the reading of a letter, or the riding of a crowded train, the film’s small moments culminate in big impact. In a word: enchanting. The film is in Hindi with English subtitles. Monday Night at the Movies is a branch of the Friends of the Medicine Hat Public Library. For more information about Monday Night at the Movies, go to: www.mhfilm.ca or contact Jane at 403-529-2209. Persian Dreams and Canine Themes Rescue Society is holding an indoor garage and craft sale on June 7th 10am to 4pm at the Kinplex Social Room, 2055 21 Avenue SE. Concession will also be available: taco in a bag, hot dogs, chips, baked goods, drinks, and more! If you would like to donate gently used items, please drop off at the Kinplex Social Room Friday June 6th noon to 7pm or call 403-529-2287. A bittersweet comedy about a long married couple spending a weekend in Paris is the featured film for Monday Night at the Movies on March 17. The film screens at 7.30 pm at the Monarch Theatre. Nick and Meg Burrows return to Paris, the city of their honeymoon, to celebrate their 30th wedding anniversary. Designed as a weekend to rediscover some romance in their sometimes bumpy marriage, long-established tensions break out in humorous and often painful ways. Along the way they bump into one of Nick’s old writing buddies, played by Jeff Goldblum, who has become a successful if somewhat vain New York author. Nick and Meg are played by veteran British actors, Jim Broadbent and Lindsay Duncan. The film is directed by Roger Mitchell, who directed the classic, Notting Hill, in 1999. Monday Night at the Movies is an initiative of the Friends of the Medicine Hat Public Library. Proceeds from the films fund special projects for the library, such as the purchase of special equipment, licenses to show films at no charge, funding children’s and young adults’ projects, purchasing dvds for the library’s collection and more. It’s only fitting that during this continued cold snap and on a day with temperatures nearing -40 including the windchill, 40 Below is announcing a Alberta-wide follow-up to its successful first publication. The first 40 Below anthology, released November 1, 2013, is a collection of poetry, non-fiction stories and essays, and short fiction focusing on winter in Edmonton. A total of 300 submissions were entered, and eventually 70 submissions from 55 writers/artists were chosen. The book sold out its first run and is now into its second printing. Now, editor Jason Lee Norman is putting out a call for submissions for winter poetry and stories from writers and artists from all across the province, including Calgary, Red Deer, Edmonton, Fort McMurray, Lethbridge, Medicine Hat, Grande Prairie, Jasper, Banff and everywhere in between. 40 Below will publish the second book, to be titled ’40 Below: Alberta’s Winter Anthology’ in November of 2015. Time to polish up those pitches; DRAGONS’ DEN producers are hitting the road this January to find the brightest business ideas in Canada. The 2014 Audition Tour will be visiting more than 30 cities from coast-to-coast in search of enthusiastic entrepreneurs hoping for a chance to enter the Den and make a deal with a Dragon. Open auditions are coming to Medicine Hat at the Esplanada Arts and Heritage Centre (401 First Street SE) on February 21 from 11:00am-6:00pm. Complete audition dates and locations are listed below. Tour dates will continue to be updated on the website at www.cbc.ca/dragonsden/auditions. The audition tour welcomes participants of all ages, with no prior television experience required. With the highly-rated ‘All-Student’ episode and the recent launch of Kevin O’Leary’s Future Dragon Fund, DRAGONS’ DEN continues to seek out and support young Canadian entrepreneurs. Aspiring entrepreneurs should be prepared to pitch their concept to the DRAGONS’ DEN producers in five minutes or less. If they show the producers that they’ve got the chops to land financial backing for their business venture, they could be invited into the Den to brave the Dragons. Prospective pitchers are encouraged to apply online and bring a completed application form to the audition. The current season of DRAGONS’ DEN airs Wednesdays at 8 p.m. (8:30 NT), with an encore episode on Sundays at 9 p.m. (9:30 NT) on CBC Television.